2 oz. per 1000 gallons. Mix with one gallon of tap water then distribute evenly over pond surface. Best results are obtained with pond aeration. Apply during late afternoon. Overnight, particles will form smaller particles that can be easily filtered out. If filtering, use a fine floss or pad filter. For severe problems reapply as many as three times within one week of first application. Reapply monthly as needed. Chemical based clarifiers remove beneficial bacteria from the pond. 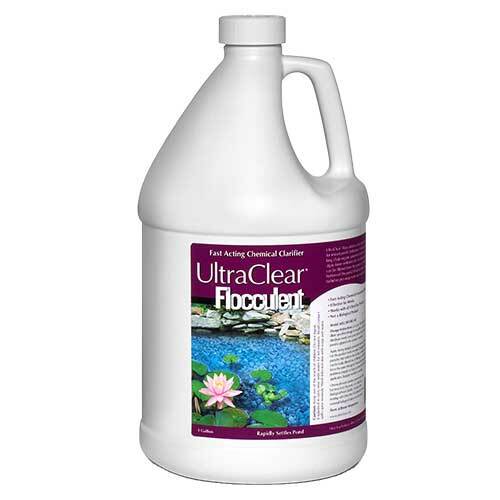 Use UltraClear Biological Pond Clarifier 1 day after treating with Flocculent.